Your reaction to that sign-off will probably depend on the tone and content of Susie’s email. If she politely apologized for the short notice and begged you to please consider whipping up what has become an office favorite (because, really, who doesn’t like cupcakes? ), you might get busy baking after work. If she was demanding and unapologetic . . . not so much. “Thanks in advance” is a rather loaded sign-off. On one hand, a study by the email app Boomerang ranked it as the sign-off . (Other forms of “thank you” also ranked at the top.) Clearly, gratitude is a solid way to end an email if you want to hear back from the recipient. If you want to steer clear of the potential misunderstandings this popular sign-off might create, here are a few options to try. There’s nothing wrong with a plain ol’ “thanks.” Taking “in advance” out of your expression of gratefulness removes the tone of expectancy and takes some pressure off the receiver. It’s a little vague, though, so if there’s any chance your recipient might find herself asking Thanks for what?, it’s better to . . .
2 Use a call to action. If you want your email to get a response, ask your recipient to do something after he finishes reading it. Let’s use Susie’s cupcake request as an example. After explaining what she hopes you’ll do, she might finish with a call to action (CTA) in the form of a question. I know this is really short notice—I clearly wasn’t planning ahead! Do you think you’d have time to make us some of your awesome treats? “Thanks in advance” can put the recipient in the awkward position of having to say no after you implied that you expected a yes. Using a CTA, however, gives the recipient options rather than expectations. That makes it both polite and effective. Here, Susie asked a direct question. She included a little mea culpa, and she didn’t make assumptions. How nice of her! 3 I appreciate your help with ______. This sign-off works best if someone has already lent you a hand. Or you can use it if you’re asking for assistance and you’re pretty sure the recipient is going to say yes because you’ve had an ongoing dialogue or your working relationship is already cooperative. 4 Thanks for considering my request. This sign-off can work well because it doesn’t presume that the recipient will do anything more than give some thought to what you asked them to do. Pro tip: It’s best to use this type of sign-off in conjunction with a CTA. Otherwise, all the recipient may do is consider your request . . . without ever getting back to you. 5 Thanks for your attention. I’m looking forward to your reply. This one is more businesslike and direct. If you do indeed expect a reply, it conveys a tone that’s firm and insistent. This one’s probably best used by managers communicating with people they supervise. When used by colleagues on the same tier, it could come across as bossy. 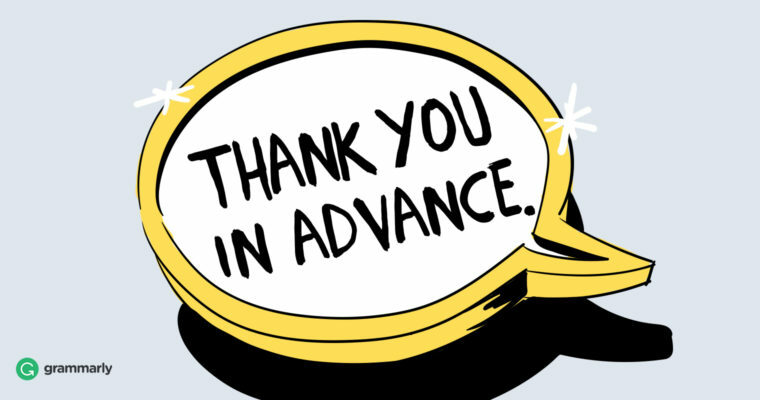 “Thank you in advance” can be useful when you know the recipient is going to do what you’re asking of them, and you want to express gratitude up front. But more often, it’s likely to be misconstrued as demanding, even if you don’t mean it to be. Dave, our office manager, retires tomorrow. I’ve been busy planning his send-off party. I noticed you RSVP’d to the invite—thanks! This morning, someone asked me whether you’d be bringing your famous cupcakes, and it dawned on me that I completely forgot to ask you about them. We’d need about three dozen for the party. Because Susie was polite and played her cards right, there’s a good chance of cupcakes at the party tomorrow. Huzzah!